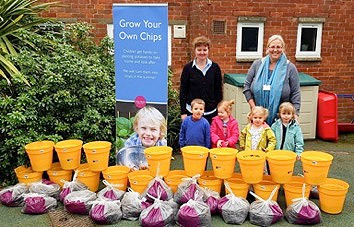 Home • News • Children Chipper About Chips! 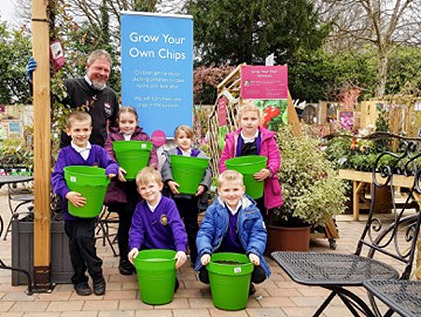 Primary school children from across the South East have been visiting Squire’s Garden Centres to learn how to grow their own chips! 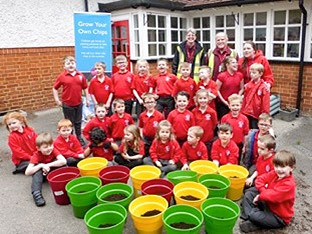 The children were given a brightly coloured pot, compost, and three chitted potatoes, and they were shown how to plant the potatoes and look after them. After their hard work the children enjoyed drinks and biscuits, then got to take their pot of potatoes home. They’ll be bringing their pots back to Squire’s in June to have their potatoes weighed and see who has grown the most potatoes. 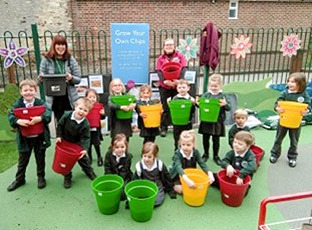 The winning child from each school will receive a goody bag, and all of them will have their potatoes turned into chips in Squire’s Café Bar – and get to eat them of course!